Switch, the Las Vegas-based company behind massive SuperNAP data center campuses in Nevada and Michigan, is expanding into the Atlanta market. The company has secured land in the market for a green-field development of a data center campus that may in the future reach several million square feet and cost billions of dollars to build, Adam Kramer, senior VP of strategy at Switch, told Data Center Knowledge. He declined to specify the location of the property. The future data center in Atlanta will be to Switch’s Grand Rapids, Michigan, site what its Las Vegas campus is to the one in Reno, Nevada, meaning it will be one of two East Coast locations that are far enough from each other to enable a resilient, redundant application topology across two geographically separated sites for its customers. Switch is going into the Atlanta data center market with several anchor tenants, Kramer said, but declined to name them, citing confidentiality agreements. The company serves a wide range of customers, including some major technology brands, such as eBay, Amazon Web Services, and Hulu. eBay was the anchor tenant at Switch’s first Reno facility, launched earlier this year. While not growing as quickly as the booming Dallas, Northern Virginia, and Chicago markets, Altanta is one of the biggest data center markets in the US, thanks to the large corporate presence in the region and it being one of the major network interconnection hubs in the South. While there are many data center providers already operating in the Atlanta metro, Switch’s biggest competitor there will be QTS Realty Trust. At the end of last year, the giant was responsible for almost 75 percent of all wholesale data center capacity in the metro, according to a market report by CBRE. Both Switch and QTS provide a mix of wholesale and retail data center services. 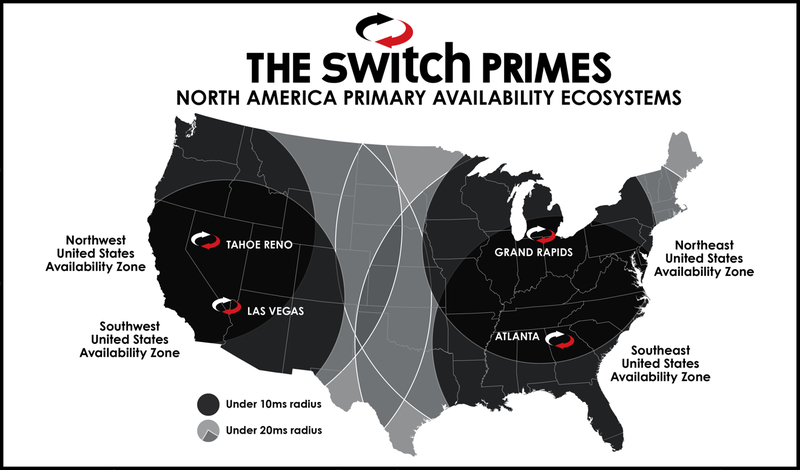 With the announcement of the Atlanta data center plan, Switch also appears to be rebranding its campuses from the old SuperNAP to the new Prime label, referring to its four locations as the Switch Primes. Like it’s done for its existing campuses, Switch said it will work on securing 100 percent renewable energy for the Atlanta campus. The company has publicly committed to powering all of its data centers with renewable energy. After years of expanding in one market – Las Vegas – Switch started expanding its geographic reach in 2015 with the announcement that it would build a data center campus in Reno. Since then, it’s entered Grand Rapids and struck joint ventures to build data centers in Italy and Thailand.